To Cite: Faramarzi A, Daroudi R, Nahvijou A , Sari A A, Arab M, et al. Economic Evaluation of Treatments for Patients with Esophageal Cancer: A Systematic Review, Int J Cancer Manag. 2019 ; 12(3):e86631. doi: 10.5812/ijcm.86631. Context: Esophageal cancer is considered as a malignant disease with fatal consequences worldwide. In cancers, it is the sixth most common cause of mortality in the world. Objectives: The aim of the current study was to assess the cost-effectiveness of esophageal cancer treatments by performing a systematic review. Data Sources: We conducted systematic searches in Medline through PubMed, Scopus, Cochran Library, EMBASE, and Web of Science databases. The search was limited to English language publications and studies published before July 17, 2018. Results: Of 2487 records, 14 articles met our inclusion criteria. Most were conducted in The United States of America (USA) and The United Kingdom (UK). The majority of the evaluations (8) followed a healthcare system perspective. Of 14 included studies, 4 compared esophagectomy with endoscopy treatment (ET), 2 compared esophagectomy with chemotherapy regimens, 2 contrasted chemotherapy regimens, and 5 studied compared palliative cares. Conclusions: Among all the assessed studies, the ET was more cost-effective than esophagectomy, but there were contradictory results in palliative care for the treatment of esophageal cancer. Esophageal cancer, including squamous cell carcinoma (SCC) and adenocarcinoma (AC), is considered as a malignant disease with fatal consequences worldwide (1, 2). Among cancers, it is the sixth most common cause of mortality in the world, with an estimated 509 000 deaths in 2018 (3). Cancer of the esophageal has a very poor survival, even in developed countries. Based on the surveillance, epidemiology, and end results (SEER) data, the 5-year survival rate increased from 5% in 1975 to 19% in 2005 (4). In addition, it is below 15% in developing countries (5, 6). According to clinical guidelines, there are different treatments for esophageal cancer, including esophagectomy, endoscopic mucosal resection, ablation, chemoradiotherapy, and chemotherapy (7-9). Each treatment has its own cost and benefit; for example, a study shows that the cost for esophagectomy and ablation was $515 65 and $174 19, respectively, while health-related quality of life for esophagectomy and ablation was 0.92 and 0.93, respectively (10). The previous evidence showed that there are many limitations in the comparison of esophageal cancer treatment, as each treatment has advantage and disadvantage; in addition, there is no predominant strategy for treatment of this cancer. Also, most studies only examined the clinical outcomes of the treatment modalities, and the number of studies that compared clinical outcomes and treatment costs was very rare (11-13). Under conditions of uncertainty and limited resources, economic evaluation is a useful tool in comparing mutually exclusive strategies and in calculating the cost and effectiveness of different strategies (14, 15). A full economic evaluation can provide experts with an analytical tool to compare health benefit and cost a therapeutic approach. Such analyses are utilized in many countries because these methods help them determine how to achieve the greatest health benefit with a limited budget, a challenge that every health system faces (16, 17). The main objective of our study was to critically appraise and summarize current evidence on the economic evaluation of esophageal cancer treatments. Furthermore, we aimed at; first, providing a summary of the best evidence to support policymaker, especially in countries located on the esophageal cancer belt; second, comparing the treatment methods of esophageal cancer to propose a cost-effective treatment. We conducted systematic searches in Medline through PubMed, Scopus, Cochrane Library, EMBASE, and Web of Science databases in July 2018. The search was limited to English language publications and studies published before July 17, 2018. To find all the related articles, we performed comprehensive search strategies to reduce the risk of losing any articles. The search strategy contained two different parts, including esophageal cancer and economic evaluation. For example, in Scopus, we applied the following search strategy: “TITLE-ABS-KEY (“esophageal cancer*” OR “esophageal tumor*” OR “esophagus cancer*” OR “esophageal carcinoma” OR “Esophageal Neoplasm*” OR “Esophagus Neoplasm*” OR “Esophagus tumor*”) AND TITLE-ABS-KEY (“cost-effectiveness” OR “cost-utility” OR “cost-benefit” OR “cost-minimization” OR “economic evaluation”)”. Our PICOD included population (P) (people of esophageal cancer), interventions (I) and comparison (esophagectomy, endoscopic mucosal resection, ablation, chemoradiotherapy and chemotherapy), outcomes (O) (cost-effectiveness including, incremental cost-effectiveness ratios [ICERs]), and design (D) (full economic evaluation). The articles studying the economic evaluation of esophageal cancer treatment were included. We included all economic evaluation studies, including, cost-effectiveness, cost-utility, cost-beneﬁt, and cost-minimization studies. In addition, we included studies that compared any treatment of esophageal cancer. The exclusion criteria were as follow: (1) economic evaluation studying that assessed Barret esophagus, only high-grade dysplasia, screening, and cancer diagnostic test; (2) review articles, editorials, and protocols; and (3) studies that compared only cost and economic burden. Study selection was applied independently by two reviewers in 3 steps. First, the records were entered in the data management software and duplicates were removed. The title of the remaining articles was screened and excluded the articles that were unrelated to our review. Second, abstracts were assessed based on the inclusion criteria and we omitted the papers that were unrelated to our study. If there was no agreement between the two reviewers for omitting an article, the third author would review the article. Finally, full-text of the remaining articles were obtained and assessed for final inclusion in our systematic review. Quality assessment of studies and data extraction were performed by two authors. Drummond’s checklist was used for quality assessment. The checklist included 10 questions (14, 18). Data were extracted for some variables from each paper. The variables were author’s name, published year, country, interventions, comparator, economic perspective, time horizon, discounting rate, cost, effect, type of modeling, incremental cost effectiveness ratio (ICER), sources for cost and effect, threshold and cancer subtype. We divided the included studies based on interventions as follow; (a) the studies were compared esophagectomy versus endoscopy treatment (ET), (b) the studies assessed esophagectomy compared with chemotherapy regimens, (c) studies that compared chemotherapy regimens, and (d) studies compared palliative care. Our main outcome measure was the cost per quality adjusted life year (QALY), although other outcome measures such as cost per life year gained and cost per survival rate were also considered. Figure 1 displayed the process of studies selection for systematic review diagram. Overall, the search yielded 2 487 hits of 5 databases. Once 1 321 records remained after excluding duplicates. After screenings and assessments, the full-text of 52 articles were assessed. The full-text of 3 articles was not available, 3 full-texts were not published in the English language, 6 records were not original paper, 16 articles were not an economic evaluation, and 10 articles were irrelevant to esophageal treatment. Finally, only 14 eligible studies were included in the review. Figure 1. 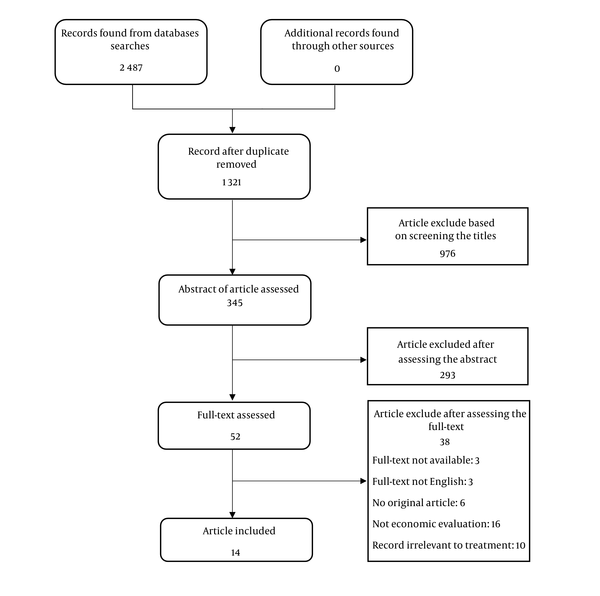 Flow diagram of selecting studies in systematic review for economic evaluation of esophageal cancer treatments. The results of the quality assessment according to Drummond’s 10 item checklist shows that out of the 14 economic evaluation, 12 studies scored = > 8 points and 2 studies scored = 6 point. The quality assessment result is available upon request. The general description of the eligible studies is listed in Table 1. Out of the 14 articles, 8 were published before 2010. The others were published in 2012 (3), 2013 (3), 2016 (4), and 2018 (4). Most of the studies were conducted in the United States of America (USA) (2) and the United Kingdom (UK) (2). Other studies were conducted in Australia (one), Taiwan (3), the Netherlands (3), Sweden (3), Greece (3), and Canada (3). The majority of the evaluations (8) followed a healthcare system perspective. Other studies were conducted from a payer’s perspective. Regarding the time horizon, time frame 1 to 5 years was utilized in 6 studies, lifetime was considered in 5 studies. Two studies applied timeframe under 1 year. Abbreviations: AC, adenoma carcinoma; ACS, Australian Cancer Study; AMACPT, American Medical Association Current Procedural Terminology; CCF, cetuximab cisplatin fluorouracil; CEA, cost effectiveness analysis; CF, cisplatin, and fluorouracil; SEMS, self-expanding metal stents; CPRD, clinical practice research datalink; CT FNA, computed tomography with guided fine needle aspiration; CUA, cost utility analysis; DRG, disease-related group; ECF, epirubicin, cisplatin, and fluorouracil; EMR, endoscopic mucosal resection; ET, endoscopic therapy; EUS FNA, endoscopic ultrasound with guided fine needle aspiration; FAMTX, fluorouracil (5-FU), doxorubicin, and methotrexate; HRQOL, health related quality of life; NCCRT, neoadjuvant concurrent chemoradiotherapy; QALY, quality adjusted Life year; SCC, squamous cell carcinoma; SEER, surveillance epidemiology and end results; SES, self-expandable stent. Regarding the cancer subtype of the esophagus, 5 studies focused on the AC, 2 included the SCC, only 3 assessed the SCC and AC, and 4 unspecified the cancer subtype. Nine included studies used a modeling technique as the major method, including decision tree (5), Markov model (1), and linear model (3). All studies were economic evaluation: 12 were cost-effectiveness analysis, 1 cost-utility analysis, and 1 cost minimization analysis. Only 10 studies used a threshold for analysis of cost-effectiveness. According to the types of treatment (interventions), in 4 studies, esophagectomy were compared with ET (10, 19-21), 2 studies compared esophagectomy with chemotherapy regimens (22, 23), 2 studies contrasted chemotherapy regimens (24, 25) and 5 studies compared palliative cares (13, 26-29). Only 1 study compared minimally invasive esophagectomy versus open esophagectomy (30). Included studies utilized different sources of cost data, national databases such as British National Health System (NHS), American Medical Association Current Procedural Terminology (AMACPT) estimates, National Health Insurance and Dutch System, or organizations such as Disease-Related Group (DRG), Medicare and Medicaid Data, or Medical Record, and Micro-Costing Models. The majority of effects data was obtained from published literature. Table 2 shows the main findings of economic evaluations included in the systematic review. Six of the 14 studies reported the mean cost for interventions, only 3 studies estimated the incremental cost, and both the mean and incremental cost were reported in the 5 studies. Abbreviations: ACER, average cost effectiveness ratio; CCF, cetuximab cisplatin fluorouracil; CF, cisplatin and fluorouracil; CT FNA, computed tomography with guided fine needle aspiration; ECF, epirubicin, cisplatin, and fluorouracil; EMR, endoscopic mucosal resection; Eso, esophagectomy; ET, endoscopic therapy; EUS FNA, Endoscopic ultrasound with guided fine needle aspiration; FAMTX; fluorouracil (5-FU), doxorubicin, and methotrexate; ICER, incremental cost effectiveness ratio; MIE, minimally invasive esophagectomy; NCCRT, neoadjuvant concurrent chemoradiotherapy; OM, operative mortality; QALY, quality adjusted life year; SEMS, self-expanding metal stents; SES, self-expandable stent. Regarding the effectiveness measure, 6 studies applied the QALY measure, and 2 studies utilized QALY and life years gained, and 5 studies used other outcomes such as survival rate, dysphagia score, and improvement in quality of life. Eleven studies could provide ICER, 3 of which showed a negative ICER. All studies applied a sensitivity analysis except 4 studies. Of interventions assessed, there were found to be not only cost effective, but also dominant treatments (ICER negative): ET over esophagectomy from a payer perspective in the USA (20), Statin therapy over no-statin therapy (23), and minimally invasive esophagectomy over open esophagectomy (30). Four economic evaluation studies were identified, the cost-effective strategy was sensitive to the age, cancer stage, comorbidity, tumor characteristics, clinician, and patient preferences (10, 19, 21, 26). The 7 included studies showed the cost-effective intervention: NCCRT compared to esophagectomy (22), the ECF regimen over FAMTX (24), CF regimen versus CCF in the first line of treatment for advanced esophageal SCC (25), SEMS over brachytherapy (27), Laser palliation (28) for incurable cancer of esophagus, and Brachytherapy over SES and laser therapy (13, 29). We conducted the first systematic review to evaluate the cost-effective treatments for esophageal cancer in the world in terms of economic evaluation studies. Of 2 487 records, 14 studies were included in the systematic review; more than half of the included studies (8/14) were conducted in UK and USA. The most perspective related to the health system (8 studies) and payer (4 studies) and 2 studies did not report the research perspective. Only 8 studies performed a sensitivity analysis. Ten studies used a threshold for analysis of cost-effectiveness. Different outcomes were applied, 8 studies had QALY outcome, 3 studies had a survival rate, and 2 studies had dysphagia score and quality of life. Our results illustrated that the ET was superior to esophagectomy because it had been most effective and less costly. Furthermore, 4 included studies assessed the cost-effectiveness ET versus esophagectomy, Pohl et al. reported that ET compared with esophagectomy was more effective and less expensive (ICER negative) (20). Three studies show that ET was more cost-effective versus esophagectomy (10, 19, 21). This finding is very important for decision-maker and health care manager in developing countries, countries located on the esophagus cancer belt, and countries where cost-effectiveness studies have not been done on esophageal cancer treatment. First, studies have shown that using esophagectomy is greater than other treatments in developing countries, while the cost of this method is more than other treatments (31-33). Second, the survival rate for esophageal cancer is very low, the 5-year survival rate in the patient that cured with surgery was 40% (34), and it was 84% for patients that received endoscopic treatment (35). Of course, this should be taken into consideration that quality of life is an important factor in using therapeutic methods. Usually, the quality of life in patients who used surgical procedures is more than endoscopic treatment. For instance, Chu et al. showed that in T1b stage, the quality of life was 4.07 in esophagectomy and it 3.85 in endoscopic treatment (21). The 5 economic evaluation studies compared palliative treatments; these studies showed contradictory results: Wenger et al. found that stenting was more cost-effective than brachytherapy (27), while McNamee and Seymour (13) and Da Silveira and Artifon (29) showed that brachytherapy was more cost-effective than stenting, laser therapy, and ablation. Moreover, Shenfine et al. reported that non-SEMS provided a higher cost and QALY comparing with SEMS (26). Xinopoulos et al. displayed that SEMS was cost-effective versus laser therapy (28). These results need to be interpreted with caution because there were various outcomes in the cited studies, QALY outcome in the studies of McNamee and Seymour (13) and Shenfine et al. (26), life years in Wenger et al. (27), and dysphagia in the Da Silveira and Artifon’s study (29); in addition, the cost of treatments is not similar in different studies. Two included studies were identified, in which the adjuvant therapy was cost-effective. Fong Soe Khioe et al. stated that adjuvant statin + surgery was dominant over no-statin therapy (23). Lin et al. cited that NCCRT was more cost effective than surgery, with a $39 060 per life years (22). Our systematic review shows that the number of studies conducted in developing countries is very rare, only one study was conducted in a developing country (Taiwan), and other studies were conducted in developed countries. Also, none of the 14 included studies have been conducted in countries located on the esophagus cancer belt. Furthermore, of 14 studies having eligibility criteria for the systematic review, more than half of the included studies (8/14) were conducted in UK and USA. Assessing this result suggests that esophageal cancer is still a major problem in developing countries and there is a needing for conducting cost-effectiveness studies in these countries. There are some limitations in our systematic review. First, we cannot be sure that no relevant study has been lost from this article. However, for this purpose, we designed a comprehensive strategy of search in PubMed, Scopus, Cochran Library, EMBASE, and Web of science, the most comprehensive databases recommended for systematic review of economic evaluation (36-39). Second, we could not access the full-texts of 3 records on the economic evaluation of esophageal cancer treatment (40-42); therefore, we inevitably excluded them. Third, we could not perform any meta-analysis, there was high heterogeneity in the methodology of included papers of our systematic review. As result, the results were evaluated qualitatively. This research is the first systematic review that assessed the economic evaluation of esophageal cancer treatment in the world. Among all the assessed studies, the endoscopic treatment was more cost-effective than esophagectomy, but there were contradictory results in palliative care for treatment of esophageal cancer. The cost-effectiveness of each intervention depends on the age of the patients, the cancer stage, comorbidity, tumor characteristics, and clinician and patient preferences. Authors' Contribution: Study designs: Ahmad faramarzi, Mohammad Arab; data collection: All authors; biostatistics analysis: Rajabali Daroudi; quality evaluation: All authors; ﬁnal revision and grammar editing: All authors. Conflict of Interests: The authors have no conflict of interests to declare for this study. Ethical Approval: This research is a part of the PhD thesis that was registered at the Ethics Committee of Tehran University of Medical Sciences. Funding/Support: There is no funding. 1. Li L, Zhang C, Li X, Lu S, Zhou Y. The candidate tumor suppressor gene ECRG4 inhibits cancer cells migration and invasion in esophageal carcinoma. J Exp Clin Cancer Res. 2010;29:133. doi: 10.1186/1756-9966-29-133. [PubMed: 20937111]. [PubMed Central: PMC2958930]. 2. Li T, Suo Q, He D, Du W, Yang M, Fan X, et al. Esophageal cancer risk is associated with polymorphisms of DNA repair genes MSH2 and WRN in Chinese population. J Thorac Oncol. 2012;7(2):448-52. doi: 10.1097/JTO.0b013e31823c487a. [PubMed: 22173703]. 3. Bray F, Ferlay J, Soerjomataram I, Siegel RL, Torre LA, Jemal A. Global cancer statistics 2018: GLOBOCAN estimates of incidence and mortality worldwide for 36 cancers in 185 countries. CA Cancer J Clin. 2018;68(6):394-424. doi: 10.3322/caac.21492. [PubMed: 30207593]. 4. Jemal A, Siegel R, Xu J, Ward E. Cancer statistics, 2010. CA Cancer J Clin. 2010;60(5):277-300. doi: 10.3322/caac.20073. [PubMed: 20610543]. 5. Mirinezhad SK, Somi MH, Jangjoo AG, Seyednezhad F, Dastgiri S, Mohammadzadeh M, et al. Survival rate and prognostic factors of esophageal cancer in east Azerbaijan province, North-west of Iran. Asian Pac J Cancer Prev. 2012;13(7):3451-4. doi: 10.7314/APJCP.2012.13.7.3451. [PubMed: 22994776]. 6. Zeng H, Zheng R, Guo Y, Zhang S, Zou X, Wang N, et al. Cancer survival in China, 2003-2005: A population-based study. Int J Cancer. 2015;136(8):1921-30. doi: 10.1002/ijc.29227. [PubMed: 25242378]. 7. Kim HL, Puymon MR, Qin M, Guru K, Mohler JL. NCCN Clinical practice guidelines in oncology™. J Natl Compr Cancer Netw. 2013. 8. Martin-Richard M, Diaz Beveridge R, Arrazubi V, Alsina M, Galan Guzman M, Custodio AB, et al. SEOM Clinical Guideline for the diagnosis and treatment of esophageal cancer (2016). Clin Transl Oncol. 2016;18(12):1179-86. doi: 10.1007/s12094-016-1577-y. [PubMed: 27900538]. [PubMed Central: PMC5138258]. 9. National Guideline Alliance (UK). Oesophago-gastric cancer: Assessment and management in adults. London: National Institute for Health and Care Excellence: Clinical Guidelines; 2018. Contract No. : 1473127920. 10. Gordon LG, Hirst NG, Mayne GC, Watson DI, Bright T, Cai W, et al. Modeling the cost-effectiveness of strategies for treating esophageal adenocarcinoma and high-grade dysplasia. J Gastrointest Surg. 2012;16(8):1451-61. doi: 10.1007/s11605-012-1911-9. [PubMed: 22644445]. 11. Arlow RL, Moore DF, Chen C, Langenfeld J, August DA. Outcome-volume relationships and transhiatal esophagectomy: Minimizing "failure to rescue". Ann Surg Innov Res. 2014;8(1):9. doi: 10.1186/s13022-014-0009-3. [PubMed: 25550708]. [PubMed Central: PMC4279687]. 12. Chen J, Lin Y, Cai W, Su T, Wang B, Li J, et al. A new clinical staging system for esophageal cancer to predict survival after definitive chemoradiation or radiotherapy. Dis Esophagus. 2018;31(11). doi: 10.1093/dote/doy043. [PubMed: 29961898]. 13. McNamee P, Seymour J. Incorporation of process preferences within the QALY framework: A study of alternative methods. Med Decis Making. 2008;28(3):443-52. doi: 10.1177/0272989X07312473. [PubMed: 18356313]. 14. Drummond MF, Sculpher MJ, Claxton K, Stoddart GL, Torrance GW. Methods for the economic evaluation of health care programmes. Oxford University Press; 2015. 15. Garber AM, Sox HC. The role of costs in comparative effectiveness research. Health Aff (Millwood). 2010;29(10):1805-11. doi: 10.1377/hlthaff.2010.0647. [PubMed: 20921479]. 16. Ettelt S, Nolte E, Thomson S, Mays N. The systematic use of cost-effectiveness criteria to inform reviews of publicly funded benefits packages. London: Report for the Department of Health, School of Hygiene and Tropical Medicine, Fevrier; 2007. 17. Silva-Illanes N, Espinoza M. Critical analysis of Markov models used for the economic evaluation of colorectal cancer screening: A systematic review. Value Health. 2018;21(7):858-73. doi: 10.1016/j.jval.2017.11.010. [PubMed: 30005759]. 18. Lao C, Brown C, Rouse P, Edlin R, Lawrenson R. Economic evaluation of prostate cancer screening: A systematic review. Future Oncol. 2015;11(3):467-77. doi: 10.2217/fon.14.273. [PubMed: 25675126]. 19. Harewood GC, Wiersema MJ. A cost analysis of endoscopic ultrasound in the evaluation of esophageal cancer. Am J Gastroenterol. 2002;97(2):452-8. doi: 10.1111/j.1572-0241.2002.05499.x. [PubMed: 11866287]. 20. Pohl H, Sonnenberg A, Strobel S, Eckardt A, Rosch T. Endoscopic versus surgical therapy for early cancer in Barrett's esophagus: A decision analysis. Gastrointest Endosc. 2009;70(4):623-31. doi: 10.1016/j.gie.2008.11.047. [PubMed: 19394011]. 21. Chu JN, Choi J, Tramontano A, Morse C, Forcione D, Nishioka NS, et al. Surgical vs endoscopic management of T1 esophageal adenocarcinoma: A modeling decision analysis. Clin Gastroenterol Hepatol. 2018;16(3):392-400 e7. doi: 10.1016/j.cgh.2017.10.024. [PubMed: 29079222]. [PubMed Central: PMC5852380]. 22. Lin CY, Fang HY, Feng CL, Li CC, Chien CR. Cost-effectiveness of neoadjuvant concurrent chemoradiotherapy versus esophagectomy for locally advanced esophageal squamous cell carcinoma: A population-based matched case-control study. Thorac Cancer. 2016;7(3):288-95. doi: 10.1111/1759-7714.12326. [PubMed: 27148413]. [PubMed Central: PMC4846616]. 23. Fong Soe Khioe R, Skedgel C, Hart A, Lewis MPN, Alexandre L. Adjuvant statin therapy for esophageal adenocarcinoma: A cost-utility analysis. Pharmacoeconomics. 2018;36(3):349-58. doi: 10.1007/s40273-017-0594-1. [PubMed: 29210031]. 24. Webb A, Cunningham D, Scarffe JH, Harper P, Norman A, Joffe JK, et al. Randomized trial comparing epirubicin, cisplatin, and fluorouracil versus fluorouracil, doxorubicin, and methotrexate in advanced esophagogastric cancer. J Clin Oncol. 1997;15(1):261-7. doi: 10.1200/JCO.1997.15.1.261. [PubMed: 8996151]. 25. Janmaat VT, Bruno MJ, Polinder S, Lorenzen S, Lordick F, Peppelenbosch MP, et al. Cost-effectiveness of cetuximab for advanced esophageal squamous cell carcinoma. PLoS One. 2016;11(4). e0153943. doi: 10.1371/journal.pone.0153943. [PubMed: 27100871]. [PubMed Central: PMC4839693]. 26. Shenfine J, McNamee P, Steen N, Bond J, Griffin SM. A pragmatic randomised controlled trial of the cost-effectiveness of palliative therapies for patients with inoperable oesophageal cancer. Health Technol Assess. 2005;9(5):iii. 1-121. doi: 10.3310/hta9050. [PubMed: 15717937]. 27. Wenger U, Johnsson E, Bergquist H, Nyman J, Ejnell H, Lagergren J, et al. Health economic evaluation of stent or endoluminal brachytherapy as a palliative strategy in patients with incurable cancer of the oesophagus or gastro-oesophageal junction: Results of a randomized clinical trial. Eur J Gastroenterol Hepatol. 2005;17(12):1369-77. doi: 10.1097/00042737-200512000-00017. [PubMed: 16292092]. 28. Xinopoulos D, Dimitroulopoulos D, Tsamakidis K, Korkolis D, Fotopoulou A, Bazinis A, et al. Palliative treatment of advanced esophageal cancer with metal-covered expandable stents. A cost-effectiveness and quality of life study. J BUON. 2005;10(4):523-8. [PubMed: 17357211]. 29. Da Silveira EB, Artifon EL. Cost-effectiveness of palliation of unresectable esophageal cancer. Dig Dis Sci. 2008;53(12):3103-11. doi: 10.1007/s10620-008-0302-2. [PubMed: 18523886]. 30. Lee L, Sudarshan M, Li C, Latimer E, Fried GM, Mulder DS, et al. Cost-effectiveness of minimally invasive versus open esophagectomy for esophageal cancer. Ann Surg Oncol. 2013;20(12):3732-9. doi: 10.1245/s10434-013-3103-6. [PubMed: 23838923]. 31. Kim SY, Park JH, Kim SG, Woo HK, Park JH, Kim Y, et al. Disparities in utilization of high-volume hospitals for cancer surgery: Results of a Korean population-based study. Ann Surg Oncol. 2010;17(11):2806-15. doi: 10.1245/s10434-010-1133-x. [PubMed: 20535571]. 32. Harirchi I, Kolahdoozan S, Hajizadeh S, Safari F, Sedighi Z, Nahvijou A, et al. Esophageal cancer in Iran; a population-based study regarding adequacy of cancer surgery and overall survival. Eur J Surg Oncol. 2014;40(3):352-7. doi: 10.1016/j.ejso.2013.10.011. [PubMed: 24238763]. 33. Song PI, Liang H, Fan JH, Wei WQ, Wang GQ, Qiao YL. Long-term survival after esophagectomy for early esophageal squamous cell carcinoma in Linxian, China. J Surg Oncol. 2011;104(2):176-80. doi: 10.1002/jso.21953. [PubMed: 21538356]. [PubMed Central: PMC3129477]. 34. McCann P, Stafinski T, Wong C, Menon D. The safety and effectiveness of endoscopic and non-endoscopic approaches to the management of early esophageal cancer: A systematic review. Cancer Treat Rev. 2011;37(1):11-62. doi: 10.1016/j.ctrv.2010.04.006. [PubMed: 20570442]. 35. Nelson DB, Dhupar R, Katkhuda R, Correa A, Goltsov A, Maru D, et al. Outcomes after endoscopic mucosal resection or esophagectomy for submucosal esophageal adenocarcinoma. J Thorac Cardiov Surg. 2018;156(1):406-413000. doi: 10.1016/j.jtcvs.2018.02.093. 36. Sanghera S, Coast J, Martin RM, Donovan JL, Mohiuddin S. Cost-effectiveness of prostate cancer screening: A systematic review of decision-analytical models. BMC Cancer. 2018;18(1):84. doi: 10.1186/s12885-017-3974-1. [PubMed: 29347916]. [PubMed Central: PMC5773135]. 37. Rashidian A, Barfar E, Hosseini H, Nosratnejad S, Barooti E. Cost effectiveness of breast cancer screening using mammography; a systematic review. Iran J Public Health. 2013;42(4):347-57. [PubMed: 23785673]. [PubMed Central: PMC3684720]. 38. Becerra V, Avila M, Jimenez J, Cortes-Sanabria L, Pardo Y, Garin O, et al. Economic evaluation of treatments for patients with localized prostate cancer in Europe: A systematic review. BMC Health Serv Res. 2016;16(1):541. doi: 10.1186/s12913-016-1781-z. [PubMed: 27716267]. [PubMed Central: PMC5048403]. 39. Nahvijou A, Hadji M, Marnani AB, Tourang F, Bayat N, Weiderpass E, et al. A systematic review of economic aspects of cervical cancer screening strategies worldwide: Discrepancy between economic analysis and policymaking. Asian Pac J Cancer Prev. 2014;15(19):8229-37. doi: 10.7314/APJCP.2014.15.19.8229. [PubMed: 25339011]. 40. Allgayer H. Cost-effectiveness of endoscopic ultrasonography in submucosal tumors. Gastrointest Endosc Clin N Am. 1995;5(3):625-9. doi: 10.1016/S1052-5157(18)30429-X. [PubMed: 7582590]. 41. Davini IN, Becagli PA, Pani M, Trippoli SA, Peverini DA, Messori AN, et al. Cost-effectiveness of neoadjuvant multimodal therapy in patients with esophageal adenocarcinoma. Oncol Rep. 1997;4(5):1033-7. 42. Dimofte G, Crumpei F, Trifina L, Nicolescu S, Leanca D. Cost-effectiveness of endoscopically placed stents in the palliation of locally advanced esophageal carcinoma. Rom J Gastroenterol. 2004;13(1):17-22. [PubMed: 15054521].